I'm seeing some interesting fares from Ottawa to Dublin, Ireland ranging from $387 to $516 CAD roundtrip including taxes on various dates in 2017 and 2018. However, most of these flights have 2 stops each way, using a combination of United Airlines and Aer Lingus - the flights are definitely not the greatest. And it's not really clear whether these prices are a mistake or not. So if you do book one, don't book anything else for at least a few days. Try dates in the months listed above. Try focusing on Monday, Tuesday, and Wednesday dates. If you see any other cheap prices that actually verify once you click through from Momondo to the booking site, please share the dates in the comments below. 3. Use the dates you found on Momondo - even try the dates that didn't verify once you clicked through from Momondo to the booking site. They might work. WARNING: CheapOAir.com prices are always in $USD - so be sure to do the math. Multiply the price you see on CheapOAir.com by 1.24 (today's exchange rate) - this will be the price you are charged in $CAD when booking with a Canadian credit card. I've had better luck finding these on CheapOAir.com ($USD site) than on CheapOAir.ca ($CAD site). 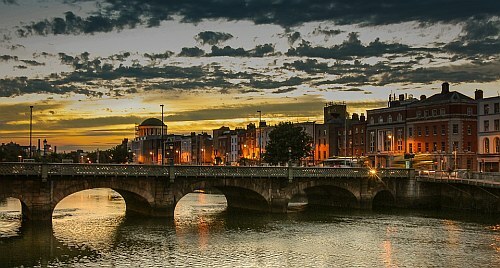 ottawa, yow, flight deals, ireland, europe, northern europe, western europe, dublin, dub, united airlines and aer lingus. Head to the YOW Deals Alerts Page where you can choose to be notified by e-mail, Facebook, Twitter, or RSS Feed the moment an amazing travel deal from Ottawa is found. 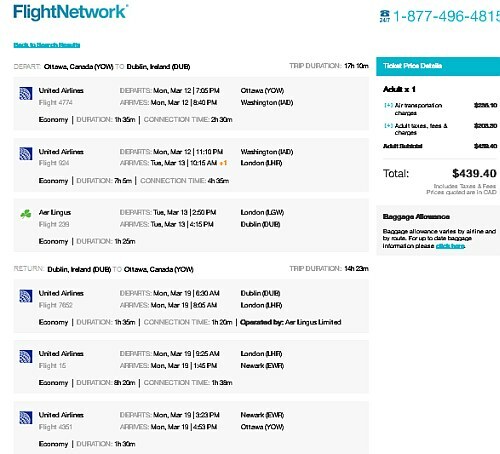 No Responses to "Ottawa to Dublin, Ireland - $387 to $516 CAD roundtrip including taxes (St. Patrick's Day and July summer flights)"